Just a small funny that is peripherally related to Guy, as it is about his son-in-law Brenden Morrow. This is the photo that the Stars handed out at tonight's game. Morrow was being honored as part of the 20th Anniversary All-Time Team. ...Benden Morrow? Oh dear. Didn't someone think to proofread these before they sent them out to print? 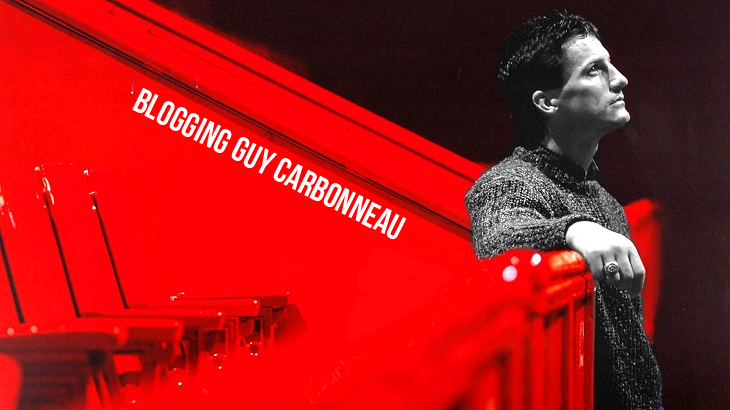 At this rate I'm really hoping they don't misspell Carbonneau, which is a much trickier name! ...and Guy is on it. Yes! I won't say how many votes I put in on the man's behalf, but it was a lot. The Dallas Stars announced the remainder of the 20th Anniversary Team, presented by Dr Pepper today. 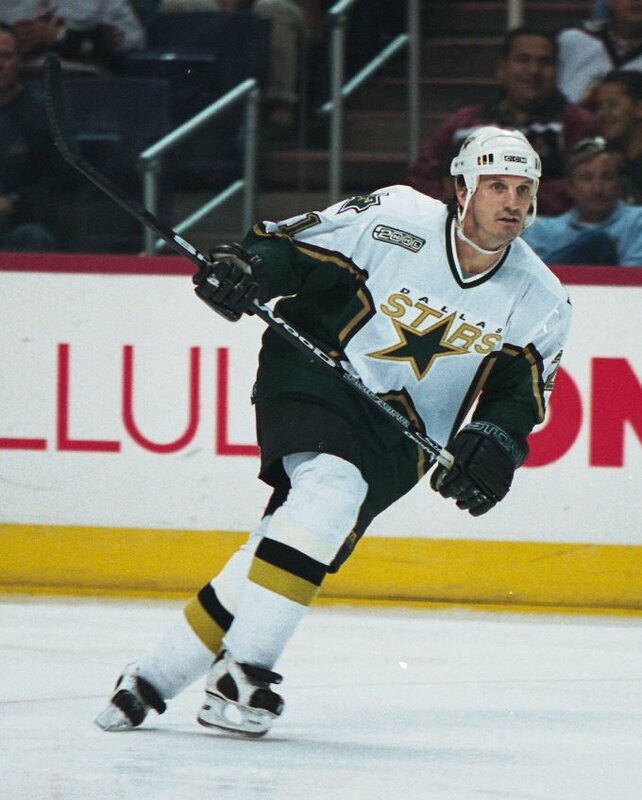 Over the course of the last month, fans have had an opportunity to vote on DallasStars.com for who they would want to play on their all-time Dallas Stars team. Marty Turco was the first member of the team to be honored on Thursday night against Vancouver; Brenden Morrow will be recognized Saturday night against San Jose, while next week's honorees include Jere Lehtinen (Thursday, Feb. 28 vs. Edmonton) and Jamie Langenbrunner (Sunday, March 3 vs. St. Louis). Members of the 20th Anniversary Team will be honored at home games with special appearances, promotions and interactive content on DallasStars.com. Commemorative photos of that night's honoree will be given to the first 10-thousand fans entering the building. The number of votes garnered for each player determined what position in the depth chart they have (i.e. first line center). Twelve forwards, six defensemen and two goaltenders were selected by the fans for the team out of more than 200 players that have skated for the Dallas Stars. In total, over half-a-million online votes were cast. The remaining honorees will be announced on a weekly basis for the remainder of the season. 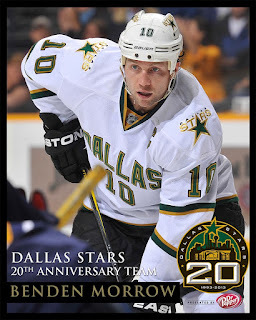 Fans are encouraged to visit DallasStars.com/myalltimeteam to view highlight videos of each player as they are honored. ...a commemorative photo of Guy? Gimme. *grabby hands* As soon as it's announced when Guy is being honored, it'll be posted here. Mentioned previously on this blog was Guy's first NHL goal, on October 23, 1982 against the Quebec Nordiques, scored on goaltender Daniel Bouchard. Guy's last NHL goal (regular season, excluding playoffs) was scored on March 29, 2000, eleven days after his 40th birthday. It was the winning goal in a road game against the Florida Panthers, scored on goaltender Trevor Kidd. And incidentally? 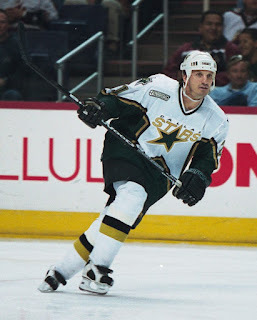 Guy was the last 40-year-old to score a goal for the Dallas Stars until Jaromir Jagr did it on January 19, 2013. You really need more chairs. This is the first in a series of five posts about Carbo's five trips to the Stanley Cup Final: 1986, 1989, 1993, 1999, and 2000. First up, his trip to the Final in 1986, which resulted in his first Stanley Cup win. There were a few stories in the 1986 playoffs. First, the elimination of the Edmonton Oilers -- Stanley Cup Champions the previous two years -- which took many people by surprise. But the bigger story, I think, was the Canadiens' rookie goaltender Patrick Roy. 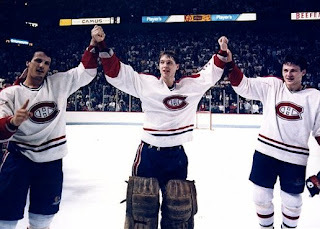 He made his first appearance in net for the Habs in February 1985 and began playing regularly the following season, winning the starting job in the playoffs. He would become the youngest Conn Smythe winner ever, at age 20. That Habs team had many young players, along with the veterans Bob Gainey (the captain) and Larry Robinson. Guy was in his fourth season with the team. Up to this point, he was the Canadiens' Molson Cup winner in 1983-84 and had scored the first of two career hat tricks. In the 1985-86 season he achieved his career high in assists (36), and appeared in all 80 games. 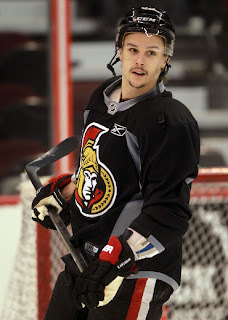 In the playoffs, he notched a total of seven goals and five assists. 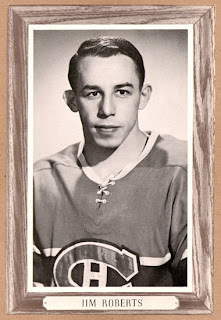 The Canadiens also had a new coach that year, Jean Perron, who in the playoffs confined his players to the team's hotel when they weren't playing or practicing. Because of this, the players dubbed themselves "Alcatraz," and had T-shirts made of their new moniker. There's a photo of Claude Lemieux, Gaston Gingras, and Serge Boisvert on the team plane returning from winning the championship in Calgary, celebrating while wearing their Alcatraz shirts. Boisvert has a rose tucked behind his ear. Before facing the Calgary Flames in the Final -- an all-Canadian matchup -- the Canadiens would first defeat the rival Bruins (in three games -- back then the division semifinal was a best-of-five series). They would then knock off the Hartford Whalers in the division final (in seven games -- the Whalers' division semifinal victory in the previous series was the team's lone playoff victory before the move to Carolina), and the New York Rangers in five games in the conference final. 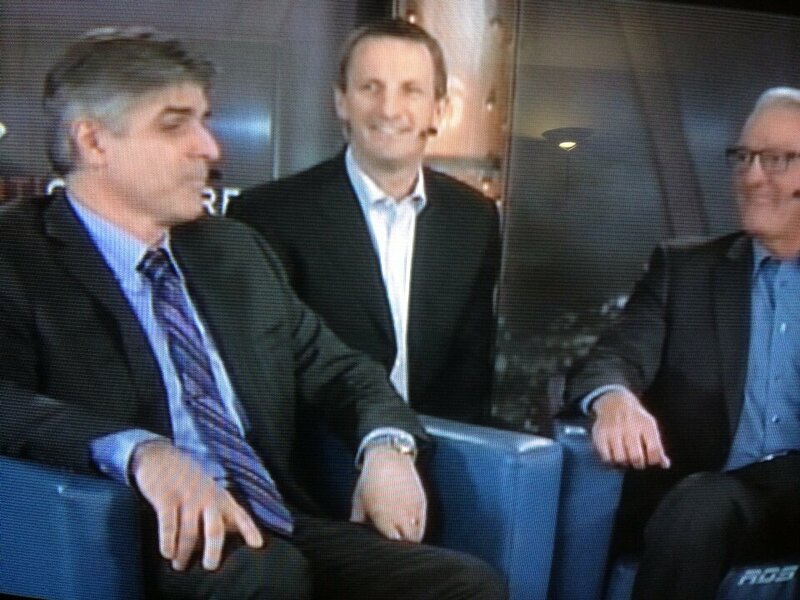 Carbonneau, Roy, and Lemieux after winning the conference final. In the Stanley Cup Final, five games were played -- three in Calgary and two in Montreal. The Canadiens would defeat the Flames by a score of four games to one. After winning, they traveled all night on a returning flight to Montreal where they were greeted at Dorval Airport by an enormous crowd. In the parade, the team traveled in convertibles and were mobbed -- the decision was then made in 1993 to have the Habs greet the Montreal faithful on raised floats for their protection and security. 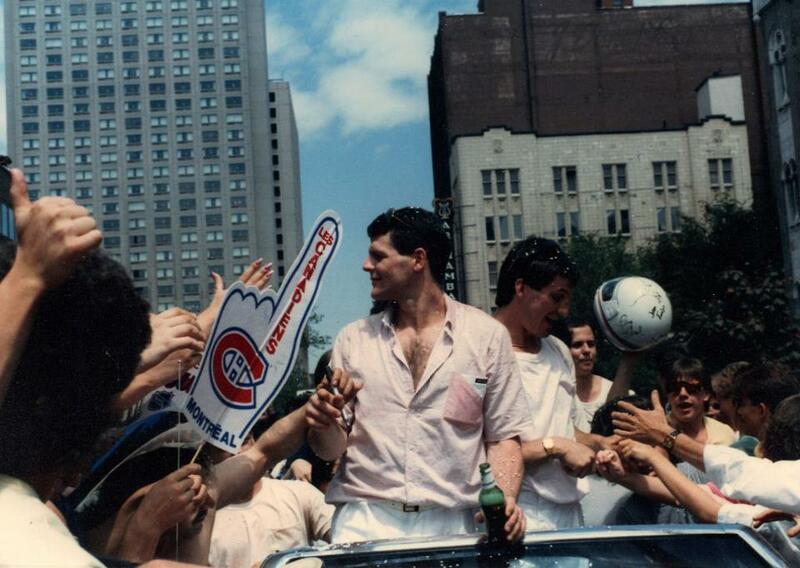 Guy (behind Chris Nilan) in the Stanley Cup parade. Nominated for the Frank J. Selke trophy for the first time that year, Guy would lose to Troy Murray. His time as the league's best defensive forward would come. But in 1986, at the age of twenty-six, he was a Stanley Cup Champion. Playing around with some video editing software, and thus I made a GIF of this early Carbo goal against the Nordiques.